Bogan Burger at The Napier Hotel – Fitzroy, Victoria | rubybeanx. Ground Pork. Sausages. Ham. Bacon. Bacon. Bacon. Wut up Ribs? It’s Epic Meal Time, the creative geniuses who created a thanksgiving roast made from quail stuffed into cornish hen stuffed into chicken stuffed into duck stuffed into a turkey, wrapped in bacon, then stuffed into a pig then wrapped with bacon. These dudes even have pretty girls eating their epic meals, so they must be doing something right. One pub in Melbourne that also has many very good looking customers eating their big meals is the Napier Hotel – home of the Bogan Burger. The Bogan Burger once held acclaim for being Melbourne’s biggest burger, whether or not somebody else has superseded it I’m not sure. But this burger is not just ridiculously big, it’s also ridiculously tasty. Wedged inbetween two slices of thick Turkish bread, there’s (are you ready? ): a steak, a chicken schnitzel, bacon, egg, cheese, onion, tomato, pineapple, beetroot, a few strands of rocket, and the topping on this burger cake, a potato cake. And to hold it all together, is a pretty little cocktail umbrella. Served with the Bogan Burger are some yummy wedges and coleslaw. Wowee. Partnered with the always grumpy looking bar staff, you can imagine that if they threw in some swear words, machoism and aviator sunnies that you could be in the kitchen of Epic Meal Time. I highly recommend sharing this burger with another person, although I have seen a few people finish it by themselves and complaining about feeling sick afterwards. Sharing it also makes for a very cheap meal. If you’re not in the mood for burger, the Napier does many other dishes, although I’ve only ever had the hit and miss kangaroo. They also have slightly less ridiculous burgers. 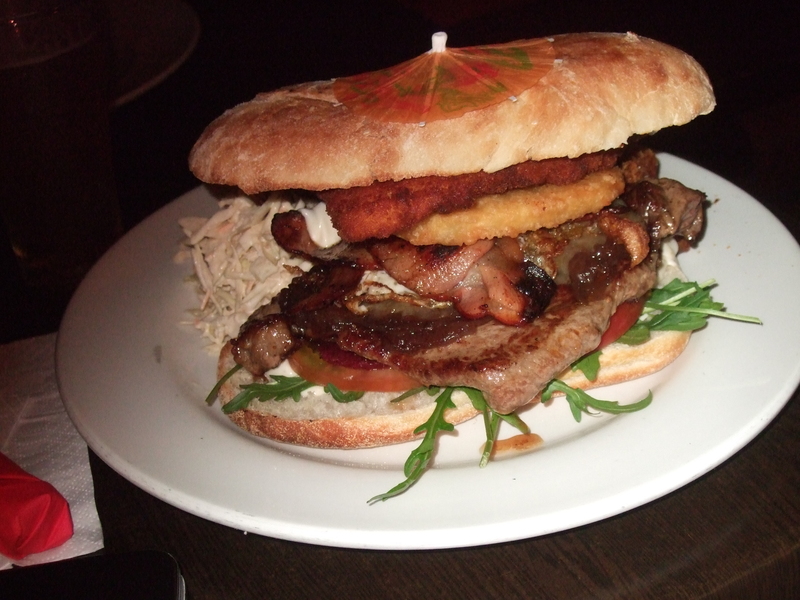 However, if you have a fast metabolism and a big appetite, the Napier’s Bogan Burger is a definite must eat. OK to bring a date? No, but it’s perfect for group gatherings. Book in advance for a large table. Tags: Burger, Fitzroy, pub grub, Victoria. Bookmark the permalink.